Inflation is Not a Big Deal. Here’s Why. James can trade down to a slightly used BMW and save a ton on insurance and maintenance. Imagine a reverse savings account. You put money into it and it will slowly erode over time at a constant rate. Let’s say that rate is 3%. So every year the amount you have in the account will decrease by 3%. So you deposit $100, then at the end of the year, you’re left with $97. If you don’t add anymore money, the following year you would lose 3% more. You would have to keep adding money just to keep your original $100 deposit. Doesn’t sound like a good deal. This is inflation. It creates an increase in the price of goods over time which erodes the buying power of your money. The most quoted inflation rate is around 3%, which is the Consumer Price Index (CPI) provided by the Bureau of Labor Statistics. And many of us have seen this in our lives. A gallon of milk in 2017 doesn’t cost the same as it did in 1997. Same goes for a gallon of gas. I’ve even written before that the only way to beat the inflation monster is to make more money and to do it FAST. Making more money is a surefire way to beat inflation, but it’s actually a lot easier than that. Many of you probably have a much lower personal rate of inflation than the 3% figure. Here’s why the idea of inflation destroying our income and retirement while we stand by helplessly is just not true. According to the CDC, the average weight of a male in America is 195 pounds. Besides that being a concerning statistic since that’s already considered overweight for most males, it also doesn’t tell you much about an individual male in America. Sure, there are males in this country who are exactly 195 pounds, but many are below that weight and many are above. The 195 pound number is the weight of a fictional “average” right down the middle American male, which most males are not. And even if you are 195 pounds, there are other factors that make that number even more useless such as height and athleticism. So that 195 pound number in a vacuum means almost nothing. I look at inflation in the same way. While the oft quoted rate of inflation is around 3%, not everyone is affected by that number in the same way. Prices vary widely in different parts of the country. Inflation could be at a rate of 5% in New York while it can be 1% in Iowa. That 3% is a countrywide average. Inflation also affects good and services in different ways. Computers cost a lot more 20 years ago than they did now. Milk costs more now than it did 20 years ago. Cars cost more now but they last a lot longer than they did before. That 3% assumes a constant inflation rate among all types of goods, which is just not true. An average can serve as a good benchmark, but your personal situation can make the number utterly useless. I never liked the idea of comparing average salaries or savings rates, as everybody’s situation is unique. Now let’s say that you are indeed this average person, and your personal rate of inflation has been increasing at a steady rate of 3%. It doesn’t mean it has to stay this way! One of my favorite quotes of all time is from British philosopher Alan Watts: “You’re under no obligation to be the same person you were 5 minutes ago.” And this applies directly to the inflation argument. If the CPI has been showing an average rate of inflation of 3% for the country, there is not much you can do about that. If your personal spending has been growing at a steady rate of 3% year after year, you can change that right now! We’re not robots that need to keep spending money on the same things over and over. There are lots of ways to do this. We can cut out things we don’t need or just spend less on them. We can buy less expensive versions of things we usually buy (skip Whole Foods and go to a normal store). If you take a good look at your personal spending, you can definitely find ways to keep more of your money and reduce that inflation rate. The fact that we can be flexible and adjust our spending to reduce our inflation rate turns traditional retirement planning on its head. Most retirement plans and calculators automatically assume that your inflation rate will be 3%. This can easily be changed so this means that most people can actually retire earlier than they thought. We also may not need to save as much money as we originally thought. This can make retirement planning seem a lot less scary and disheartening. That being said, I’m usually pretty conservative when it comes to saving and investing. So assuming an inflation rate of 3% is not the worst thing, because it will at least ensure that you will have enough money to reach your goals. Don’t get me wrong, inflation is definitely real and it has very real effects on people’s lives. But it’s not as big of a deal as its made out to be. Capitalism wants people to keep consuming until the end of their days. If you follow along, then your inflation rate will certainly be 3% or even more. But it doesn’t have to be that way. You can adjust your spending so you actually spend less of your money than you did in the past. Humans are a lot more flexible than they think, and I believe everyone can find ways to make inflation a very minimal factor in their personal economy. My first and only job before joining the optical field was as a Starbucks barista. It was hard work but I enjoyed it and learned a lot. We had to manually and carefully load espresso into the machines back then. No push button lattes! My first year of income led to a nice refund at tax time. I didn’t know anything about withholding rates. Someone told me just put 1 on the W9 and you’re good to go. And I got a bigger and bigger tax refund each year. It was great! I thought the government was so nice. But after learning about the tax code, I realized I was just giving up my present income so the government could have some more money during the year. I was giving them an interest free loan of a few thousand dollars every single year! Now, I try to get my refund as close to zero as possible. At the same time, I accordingly increase my savings and debt payoff contributions. I’d rather have that money work for me throughout the year. That being said, if you do receive a refund, you have to do something with the money. 2. Reserve the Tesla Model 3. There is no car more coveted than the Tesla. The Model 3 is a relatively affordable $35,000. Put down the $1,000 reservation fee and figure out how to pay for it later when it arrives in 2018. While those are four pretty interesting ways to spend your tax refund, let me propose an alternative. How about spend your tax refund on things that let interest work for you? This will make your money go the extra mile. 1. Pay off your credit card debt. The best thing to do when it comes to credit card debt is to avoid it. The next best thing to do is to pay it off ASAP. Credit cards charge extremely high interest rates. The national average hovers around 15%, which is absurdly high. This means that unless your investments are rocking and rolling and you’re getting a consistent 20%+ return year after year (which is nigh impossible), you need to get rid of that consumer debt FAST. This will free up cash flow faster and save you a lot of money on interest payments. 2. Increase your 401k contribution. I like this suggestion. I’m glad I thought of it. The reason I like it is because it’s the most hands off and effective way to spend your refund. If you already contribute to your 401k, just sign in to your account and increase your contribution percentage by a point or 2. You will not miss the money trust me. Once the tax refund hits your checking account, do nothing! It’s as easy as that. Your increased contribution rate will take that extra money throughout the year and get it invested. You will save money on taxes and increase your retirement savings in one fell swoop. 3. Fund a Roth IRA. If you have maxed out your 401k, the next thing to focus on is your Roth IRA. Combined with a pre tax 401k, the Roth IRA will allow you to withdraw money tax free, providing tax diversification for the future. Because Donald Trump is the president so who knows what the future will bring? The max contribution to a Roth IRA is $5,500 per year. A tax refund of a thousand or so will get you almost 20% of the way there. If you wish to max it out, you can set up automatic contributions for the rest of the year to get you there. Another reason I like (love?) Roth IRA’s is that you can withdraw any contributions you’ve made to the account without penalty, as long as you’ve had the account for 5 years. So it can serve as a quasi emergency fund if needed. 4. Make an extra student loan or mortgage payment. Depending on which of these debts has a higher interest rate, you can add rocket fuel to the payoff time with a nice lump sum payment. Both of these debts can potentially give you some tax savings, so they’re not the WORST type of debt to have (see #1). But debt is debt, and it should be paid off as soon as possible. Just make sure to let your lender know that you want the payment to be applied to your principal amount ONLY. Many lenders will pull a dirty trick of having it applied to interest first, which does nothing for you but everything for them. Which is why it’s better to be debt free than continuing to do business with greedy banks! You can certainly spend your refund on the things on the first list. It would make for a nice story and talking point. But with all material things, the glamour fades very quickly. And you’re right back to where you started financially. Spend your refund on the second list, however, and you will provide a nice boost towards financial freedom. In the end, that is truly what we’re all looking for. Once you reach there, you can spend all the nights you wish at Trump Tower. My note: The following is a gracious guest post from Kathryn, who has an excellent blog called Making Your Money Matter. If you want a complete financial lesson on any and every financial topic from an actual financial professional, head on over to her website. Honestly, this is the type of information that I’ve seen only available in paid courses, but you can get everything on her site free and clear. Without further ado, here is a fantastic post by Kathryn talking about some essential tax tips for professionals. Kathryn Hanna is a CPA and specialized in business and personal taxes when she worked in public accounting. She currently stays home with her 3 children and blogs at www.makingyourmoneymatter.com to help people improve their understanding of personal finance and thereby improve their lives. She loves all things money and especially spreadsheets. If the only sure things in life are death and taxes, I’m sure we can all concur that it’s more fun to talk about taxes than death. The basic formula for taxes is really quite simple, it’s just the fact that there are so many exceptions and rules that make it incredibly complicated. Fortunately, you don’t have to know all the rules, just the ones that you need for your own personal taxes! There are 3 things that I believe will be most beneficial for every new (or even not so new!) professional to know related to taxes. These are things that will help you reduce taxes and build as much wealth as possible. Once you’ve gotten used to the huge chunk of money being taken out of your paycheck for taxes, you might just ignore taxes altogether (at least until April each year!). However, FICA, federal and state taxes alone will likely be upwards of 15-20% of your pay. I calculated my total taxes as a percentage of my income for 2016 and found that over 25% of my income goes toward various types of taxes. This is my largest expense, exceeding my total housing expenses including utilities! Likely, taxes just might be your largest expense as well! While I acknowledge the importance of tax funds to keep our country running, I’m all about minimizing my taxes to not have to pay more than my legal share. By learning more about how taxes impact various decisions, you can minimize your taxes and keep more of your money in your pocket. The first step is to get a really good understanding of your current tax situation. Go through your most recent tax return and make sure you understand, line by line, each and every income, deduction, credit, and tax calculation. If you have any new financial situation come up, research and make sure you understand the tax consequences. As a new grad, you were probably super excited about having any sort of income. A paycheck large enough to cover eating out instead of sitting at home with Ramen noodles or a tuna sandwich is life-changing. Earning income is great! However, that salary you are getting is the nearly the most expensive type of income there is. First, you’ll be paying Social Security and Medicare taxes on it at a rate of 7.65%. Then, you’ll need to pay federal income taxes on your salary likely in the range of at least 10-15% if you’re a single person just starting out. Also, your state will want their cut of taxes, which will add another few percent (the tax rate is 4.25% in my home state of Michigan). That’s a lot of your hard-earned money going to taxes. The only income that is even more expensive to you than employment income is self-employment income due to having to pay twice the Social Security and Medicare taxes. However, being self-employed can increase your income at much higher levels than working for someone else, so I’m definitely not discouraging it! The moral of the story here is to increase your other income streams in addition to increasing your salary. Taxes make a significant difference in the amount of your income that you actually keep, so increasing your portfolio income will help you get ahead in the long run. In addition, saving money in retirement accounts will help you to defer your tax on that income for 30+ years or more. It will make a huge difference in helping those funds grow more quickly for your future retirement. Another vital piece of knowledge is understanding your marginal tax rate. Your marginal tax rate is the percentage of tax you will pay on your next dollar of earned income. This is not to be confused with your effective tax rate, which is determined by dividing your total federal tax liability by your total income. The main reason that there is often a large difference in the marginal versus effective tax rate is because the U.S. has a progressive tax system. A progressive tax system is where the tax rates increase with higher income levels. Those with high income are still taxed on the lower rates for the lower portion of their income. This is shown in the tax rate brackets shown in the example below. In addition, the difference in effective and marginal rates may also be due to a substantial amount of non-taxable income items or tax deductions and credits that decrease income. The effective rate you are paying on your taxes is only 9.9%, which is calculated as $5,435 in total tax divided by $55,000 gross income. However, your marginal tax rate is 25%. Your next dollar of income will actually be taxed at a 25% rate, assuming it doesn’t give rise to additional deductions (for example, if you contribute this “extra” money to retirement accounts, it will not be taxed currently). The marginal tax rate is determined by looking at the highest tax bracket, as determined by your taxable income. Looking at the tax rate table below, you can see that with a taxable income of $38,650, this would put you in the $37,650-$91,150 bracket, which is taxed at a rate of 25%. Looking at the tax table, you can also see that you can earn an additional $52,500 in income before increasing your marginal tax rate to 28% ($91,150 less $38,650). Understanding your marginal tax rate will give you a realistic view of how much that raise or bonus is actually going to be on a cash basis for you. It also will hopefully encourage you to contribute more to retirement accounts as your marginal tax rate goes up and those tax deductions become worth even more. Understanding income taxes is key to building your wealth through the years. Because of the progressive tax structure in the Unites States, it is even more important to understand your taxes as your income grows throughout the years and the value of your tax deductions increases. Start now by looking at your current tax situation, making a plan to increase your passive income streams and determining your marginal tax rate. Future you will thank you! This information is meant for educational purposes and does not represent individual tax advice. If you have questions about your personal tax situation, it is highly recommended to meet with a tax advisor or attorney. Fantasy football is one of the most polarizing things on Earth. One on end you have people who are deeply embedded in the culture. They have been playing in multiple leagues for years and have parties commemorating the start and end of the seasons. It’s a way of life. On the other end, you have those who think that those who participate in fantasy football are delusional and wish they were real athletes. I’m somewhere in the middle, as I like playing but don’t do it with a lot of fanfare. And I do wish I was a real athlete. For those readers who are uninitiated in the ways of fantasy football, it is a game for football enthusiasts in which you select a team from the pool of current NFL players. Based on how well the players do throughout the season, the team with the most points at the end of the season is the winner. You have to keep track of player performance, injuries and other league events to make sure you are fielding the best team possible. This is usually played online nowadays and some league winners get cash prizes while others just get bragging rights. It’s all in good fun, but there are some hurt egos along the way. I bring this up because football season has just started, and I have noticed a bunch of similarities between fantasy football and investing. In essence, they are very similar because you have to actively track how your players (investments) are performing and make adjustments along the way to win the league (reach your investment goals). This is an SEC mandated statement that all mutual fund companies must put in their ads. It’s a warning to investors that just because a company has done well in the past, it does not mean they will do well in the future. If investors actually heeded this advice instead of listening to the latest stock tip, then we would have a lot more wealthy people in this country. After looking at the top fantasy players from year to year, I realized fantasy football leagues should also mandate this statement. Besides the many off the field issues that can affect a players performance (such as injuries, suspension, personal problems etc), even the top players in the league can have unpredictable results. If a player has a tougher than normal schedule for the year or just a handful of poor performances, it can affect their results for the entire season. Just picking the best performing players from the previous year is not a terrible strategy, but it probably won’t get you very far. Many of those players may not do well this year and you will miss out on those players that have drastically improved their play. Lesson Learned: Don’t pick investments based on how they performed last year. And don’t pick players thinking they will replicate their production from last year. Look at the whole picture. I enjoy watching Sportscenter and listening to NFL podcasts, so I hear lots of different views about who the best players are. Everyone has an opinion on who they feel will be “dud” or “stud” in fantasy football. And if you listen to more than one person, you will probably get more than one answer. All sports writers and pontificators believe they “know” who will play great and who won’t. But as history shows, no one really knows. If they do get it right, it’s mainly because of the broken clock theory. Even a clock that doesn’t work is right twice a day. Sure, there are players like Tom Brady, Antonio Brown and my man Odell Beckham who will likely light up the scoreboard year after year. But it’s extremely difficult to spot those players that come out of nowhere or to guess who will have a big drop off this season. It’s difficult, but people will still try to guess. And the same goes for investing. Watch MSNBC or any other financial reality show for long enough and you will think the entire stock market is going through the roof. Or that you should stockpile gold bars since the world is coming to an end. Or that the latest election will produce disastrous results in the market. Depends on what will drive ratings that day. There will be so many passionate opinions that the average person won’t know what to think. Mutual fund managers will urge you to sign up for their funds, but that may or may not be the right strategy for you. Do your own research depending on your risk tolerance and investing timeline. There is no one size fits all answer and that applies to fantasy football and investing. Lesson Learned: Tune out the noise. Everyone thinks they found the winners but most of the time your guess is just as good as theirs. Every fantasy league has “that guy” who is always wheeling and dealing. His transaction history is super long and he’s always looking to trade away his players. He loves being plugged into the latest news and is scouring the waiver wire to find the next big thing. “That guy” usually doesn’t win the league. More than likely the owner who picks solid and dependable players who perform consistently will win the league. There is definitely a little luck involved to do well in fantasy football. But picking solid players on great teams and staying the course is usually the way to go. You will have the random backup wide receiver who has a great game and then is picked up that same hour. He will be the “hot” player that everyone is clamoring after. But then he might not do much the rest of the season. All the while you’re consistent player will be racking up points riding the bench. This lemming mentality plays itself out in the investing world as well. As soon as some type of international incident happens, the knee jerk reaction is to sell sell sell! So many people sell that the market takes a sharp dip, and this causes even more people to panic and sell. Lesson learned: Don’t pick up a player just because everyone is talking about him. And don’t invest in a stock just because it is the latest “hot” pick. Do your research. There’s a reason the herd doesn’t get great returns. I love football and I love investing, so I’m probably going to find similarities between them. But the similarities between fantasy football and investing are so clear. Now someone should do a study comparing fantasy football performance with investment returns! I don’t think Walter White needs 85% of his pre-retirement income. When I graduated from optometry school waaaaaaayyy back in 2009, I started to finally make some real honest to goodness money. I figured I should learn more about this finance thing and proceeded to read almost every personal finance book at the library. I started to follow awesome blogs like Ramit Sethi’s and Mr Money Mustache. Being a personal finance novice, I eagerly soaked up whatever information I could. This led me to be on both sides of the argument on many different issues. Debt is evil! But some debt is okay. Increasing your income is the way to wealth! But so is being frugal. While some of my stances on different issues are pretty solid at this point, I’m always learning new things that affect one opinion or another. But one thing I’ve never liked throughout my financial journey are retirement calculators. You know, those websites where you input 5 different pieces of information and you’ll find out how much you’ll have during retirement. I’m not sure why I’ve never liked them initially. Maybe because retirement was so far away. Or the fact that I thought I was done with calculators once I got out of school. But after reading more and more on personal finance, I’ve realized that retirement calculators are downright dangerous. That’s because they assume you will participate in lifestyle inflation! I’ve talked about the dangers of lifestyle inflation a number of times on here. Pretty much it’s when you start spending more once you start making more. It is the killer of dreams and it’s what keeps most Americans in debt regardless what income class they are in. Almost everyone would agree it is a bad thing. But not retirement calculators. I was fiddling around with my company’s 401k retirement calculator, and at my current contribution rate (maxing it out!) it said I’m on track to have a great retirement by age 60. Great news. Then I started playing around with some numbers. What if I changed my contribution rate? What if my salary changed? I found that if I doubled my salary and kept the same contribution rate, my retirement was in danger. What in the hell? If I make double the money I will be worse off during retirement? In what universe does that make sense? In the sick universe of retirement calculators, that’s where! According to the same calculator if you work hard and end up making $200,000 per year, saving $85,000 for retirement will magically not cut it anymore. That’s because they assume the extra money you make will be going towards new expenses and not towards things that can actually produce more wealth. This assumption shows a lot about the mentality in this country as well as the retirement industry. While it’s good to be conservative and assume you will need more money during retirement, assuming that your expenses during retirement will increase in step with your pre-retirement income makes no sense. Maybe this is not a big deal. Maybe I just got offended because a calculator told me my retirement was in danger since I’m making more money than I was before. It does make sense to be conservative when it comes to retirement. But what doesn’t make sense is that this rule of thumb is like gospel throughout the retirement industry. What financial advisors and retirement specialists should be saying is that when you make more income, don’t increase your expenses! There are so many financially positive ways you can apply your extra income. You can pay off debt, increase your emergency fund, invest it into equities or real estate or use it to help out a family member or charity. The idea that you will need more money during retirement just because you are making more before retirement is preposterous. Studies show most retirees become naturally conservative compared to their working years. And it’s also important to remember that during retirement you won’t be saving for retirement anymore! So a huge expense is already gone. Lifestyle inflation is what keeps most middle and upper class people in the paycheck to paycheck cycle. It’s a type of hedonistic adaptation that is dangerous because it can keep you from fulfilling your dreams and spending time with the people that matter. Don’t let a retirement calculator tell you otherwise! Investing can be a tricky business. You have to determine why you’re investing and what you’ll be investing in. Then you have to make investing a habit and do it regularly. But you also have to watch yourself and make sure you don’t abandon your well thought out plan and change your investments around once the going gets rough. It has been normal as of late to experience a 2% gain one day followed by a 2.5% loss the next day, and vice versa. Listening to most financial news outlets, you would believe that these are the darkest days the market has seen in a long time. While it is true that the S&P has seen some dramatic ups and downs as of late, it has not reached the “correction” stage as many financial television stars have been breathlessly predicting the past few months. Even after the infamous Brexit vote, the stock market actually GAINED ground for the week after a big single day loss after the vote. For those heavily invested in the stock market, watching these wild swings can be dizzying. But the market goes up, and the markets go down. That’s what it has always done and that’s what it will always do. The important thing for investors to remember is to stay with the plan through thick and thin. If you and your financial advisor have already formulated a long term investing plan, you can be sure that volatility, or the ups and down of investing, has been taken into account. While timing the market is usually an exercise in futility, the market has historically been pretty predictable as a whole. Taking a long term view, let’s say 30 years or more, the market has always gone up in any such period. After bear markets and periods of volatility, the market has rebounded to new heights. This was most likely taken into account when forming your financial plan, so there is no need to abandon the plan if a little volatility rears its head. In fact, doing so would be foolish and harmful to your wealth. To make money with any investment, you need to buy low and sell high. By abandoning stocks in your 401k when there is a downturn, you are essentially buying high and selling low, exactly the opposite of what you should be doing. Staying the course sounds great in theory, but it can get old after a while and start to wear you down. Listening to the doom and gloom of the mainstream media and talking to people who are making big market moves can make it tempting to pull the trigger. Pushing that panic button could torpedo your entire financial plan. Sitting on the sidelines during dramatic market swings can actually wear an investor out, and the idea of keeping your money “safe and sound” in a money market account sounds really enticing. But, again, it’s important to remind yourself that markets go up and down. That is simply the nature of the beast. Find a way to tune out the noise to avoid any volatility fatigue. This could mean not watching any financial media for a few days, getting a pep talk from your advisor or reading a common sense investing book. You can be your own worst enemy when it comes to making investment decisions. Sometimes, the best course of action in times of turmoil is to do nothing. Let others head for the hills and abandon their stocks, which will invariably happen as we see a rush of investors dumping equities and heading to bonds. Sticking to your plan will allow you to pick up stocks at a bargain and be poised to gain tremendously when the next market upswing occurs. So while others will be scrambling to get in on the gains, you will already be locked in. Think about that when the idea of staying the course starts to wear on you. Investing for retirement is usually not a topic of discussion among new graduates. Most Millennials would rather talk about Pokemon Go or Game of Thrones, Two things I have thankfully not gotten sucked into yet. A discussion about student loans may follow. And then maybe how crappy the economy is and how hard it is to find a good job or start a business. But talking about retirement or when to stop working full time is not usually a riveting discussion. Some just don’t understand how retirement accounts investments work, and they don’t care to learn. Others dismiss the idea of retirement altogether, claiming that they will just work for the rest of their lives. Sounds like committing yourself to a life sentence. If you’re self employed or work for a large company, you need to talk about retirement. If you have the most fulfilling and rewarding job ever, you still need to talk about retirement. That amazing job may not seem to fulfilling 20 years from now. In the business world, you need an exit strategy. You have to plan for how you’re going to leave your work and set things up so you have enough money to live on. This is what retirement planning is in a nutshell and the earlier you get a plan set up, the better off you will be. And the ONLY way to give yourself a shot at a great life post work is to invest. Being able to save money is an essential step to having good retirement income. And finding a way to make that money grow is just as essential. But why? Can’t you just put money into a savings account or under your mattress and not bother taking investment risk? No, you can’t. If someone makes $100,000 per year and is able to save 10% of their income into a regular old savings account every year from age 30 until when they retire at age 60, they will have $300,000 saved up. Not a bad sum right? Wrong. This person was living on $90,000 per year during their working years. Having $300,000 in the bank mean they can live the same type of life for a little over 3 years. Even if they cut their cost of living in half to $45,000, that’s still just over 6 years worth of money. Average life expectancy is around 78, so this person still has a decade or so to live with no money in the bank. So this person was able to save a decent amount of money for decades and will only be able to survive on their own for 3 years? How can anyone live a long and fulfilling retirement? By investing their money, that’s how. It’s all a numbers game at this point. This person could decide to either work a lot longer, save a lot more or live on a lot less. Saving 10% per year for 30 years is actually a pretty good savings rate in this day and age, so I’m not sure how many people would be willing or able to do more. Obviously, we should always be trying to save more and live on less. That is the cornerstone of personal finance. But even better would be to combine those ideals with investing, which allows your money to grow and compound over time. What would change if this person decided to invest that $10,000 a year into a retirement account instead of a savings account? After running through some retirement calculators I found that at a conservative rate of return of 6%, this person would have a little over $637,000 to spend in retirement after taxes are accounted for. You read that right, just by putting their money into a retirement account instead of a savings account, you are able to more than DOUBLE your money. Now being able to invest like this does require some education and up front work, but not really too much. And I would say it’s well worth it if you can double your money. This is the power of investing and this is why everyone, even new grads saddled with student loan debt, needs to start investing early and give their accounts lots of time to grow. Stocks, bonds and mutual funds. Investment properties, house flipping and wholesaling. Commodities, start ups, local businesses, your own business Bitcoin, and peer to peer lending are just SOME of the ways you can invest. Where is a new investor supposed to start? It can be overwhelming when you look at all of the options out there. And each type of investment has its own world of information to learn. But the best place to start would be a 401k. If you work for a company they probably have one and if you’re self employed you can open one for your business. The reason I recommend starting with a 401k (or a Traditional IRA if your workplace doesn’t have one) is because the contributions you make are tax deferred and so is any growth in the account. This is very advantageous especially if you start contributing early in your career and give the account time to grow. Once you choose what type of investments you want, start contributing regularly and watch your net worth skyrocket over time. My next piece of advice would be to do research! No one can walk you through investing step by step because there is just so much information available. Do some research on different ways to invest, such as real estate or dividend investing. If something strikes your fancy, look into it some more and see if it’s worth putting your money in. Investing is one of those things that are east to get into but difficult to master. But you don’t have to be a master to have a stable retirement. You just have to start early and let your money grow. Students in undergraduate and professional school usually have one thing on their minds: sleep! The next thing is usually studying to do your best (or to just stay afloat) in your respective program. Many times this requires a laser like focus where nothing else matters except the next test or practical. But on the other side of that diploma or degree, real life is going to be waiting. Which means you are going to have to make a lot of financial decisions which could potentially affect the rest of your life. I would advise students to take a few minutes a week (that’s really all it takes) to read some good books and form some type of financial plan. These are light reads that are packed with great information to get you started on the right financial footing. Good grades are important, but you’re only in school for a small part of your life. Taking some time to plan the rest of your life is essential. This is the first book i read after graduating optometry school. And I’m glad I did. It touches on some theory when it comes to investing, but it is ultimately a very practical book and this is what I appreciated about it. Ramit talks about what specific bank accounts he recommends, how to invest and even how to negotiate when buying a car. The overarching theme from this book is to DO SOMETHING rather than not acting. Getting 80% of the way there is a whole lot better than getting 0%. If there ever was a book out there that tells you what REAL wealth looks like, this is it. MND is a light read that talks about the characteristics of real life millionaires. Despite what society and the media tells us, millionaires don’t usually drive around in luxury cars and have gigantic houses. More often than not they are hard working people who spend their money very wisely for a long time. This book is especially important for those new grads looking to get a new car and/or house right away. If you want to be a millionaire, this book will show you that’s just not the way to go. I was fortunate to read this book while I was in optometry school, and I’m really glad I did. It is a light and short read that can help establish a solid financial foundation. The book consists of Biblical sounding parables that contain financial wisdom. The main theme I got from this book is the biggest financial lesson of all: you will never get ahead unless you spend less than you earn. Constantly spending 100% of your earnings is no life at all. This is a great book geared mainly to MD’s and other health professionals, but has some great advice for everyone. 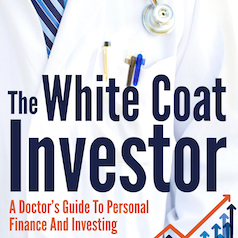 The White Coat Investor is a fantastic blog that teaches professionals about student loans, investing and keeping more of your money. Honestly, it is one of the blogs that inspired me to start blogging and trying to help my fellow broke professionals. Great book for investors and a must have for anyone graduating from professional school.